Are Your Teeth Sensitive to Hot or Cold? Find Out Why? Have you ever experienced sensitivity in your teeth when drinking hot coffee eating cream? How about when brushing your teeth? Ever wonder why this happens? 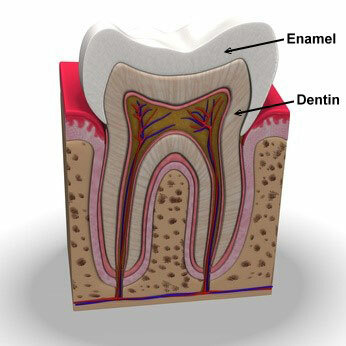 Most of the time it is due to enamel wear of teeth. When this happens, the dentin (sensitive part of the tooth) is exposed and left vulnerable to all kinds of painful experiences, depending upon how severe. Good oral hygiene – The most obvious and important tip for keeping teeth and gums healthy. Gums protect your teeth just like enamel; your gumline prevents food particles and bacteria from entering below your gums. If your gums are unhealthy from lack of proper brushing and flossing, gums can recede, exposing tooth structure that is less protected causing discomfort. If brushing hurts, all the more reason to maintaining good oral habits. At Honig Orthodontics we recommend a soft bristled toothbrush and non-abrasive toothpaste. Hard bristled toothbrushes encourage gum loss and whitening or anti-tartar toothpastes can be abrasive, causing the sensitivity. Feel free to contact our office or leave comments about tooth sensitivity below. At Honig Orthodontics, our goal is to educated our patients and families about all aspects of dental care.